I’m back from my long weekend spent in the Mid-Atlantic, and did I ever find some doozies! You, dear Labelscar reader, are in for some treats. 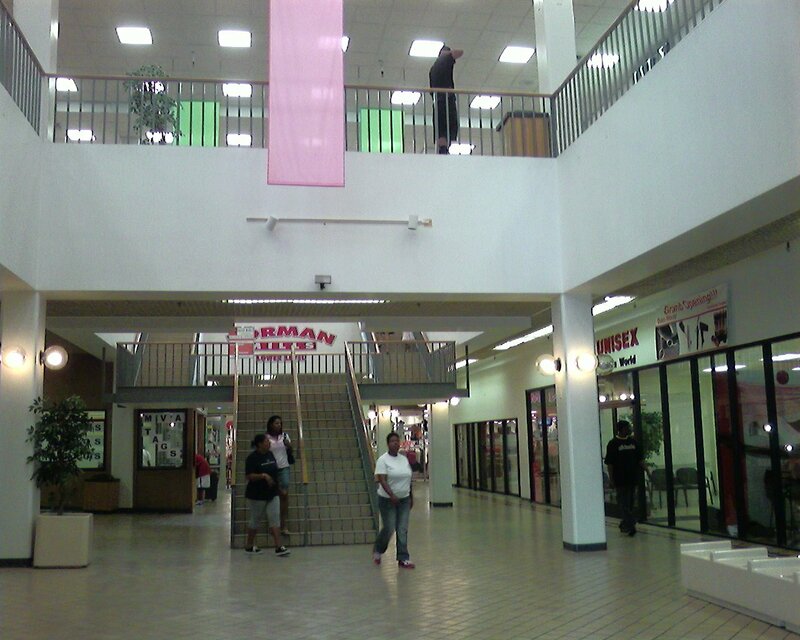 I thought I might start with one of the most interesting malls that I found: The Iverson Mall in Hillcrest Heights, Maryland. 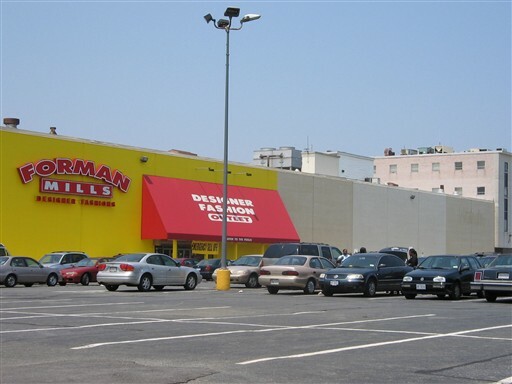 Located along Maryland Route 5 about a mile or so outside of the District of Columbia, just over the border from D.C.’s notorious Anacostia neighborhood, this 526,731 square foot center is one of the oldest–if not THE oldest–enclosed mall in Prince Georges County, Maryland. The two-level Iverson Mall opened on September 21, 1967 with Montgomery Ward and Woodward & Lothrop as anchor stores, though as you might imagine neither still exists today. It also bucks the trend of most urban malls: according to this flyer (PDF warning, though it includes a directory and a photo, making it well worth clicking), it’s even the highest-grossing shopping mall in PG County, with a vacancy rate of only 2%. 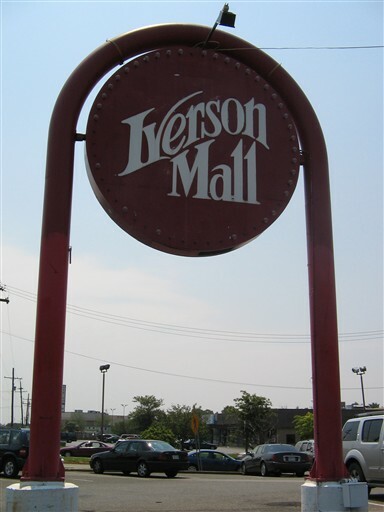 Unlike most older malls, the Iverson Mall website even–refreshingly–includes some information about its heritage, including a historic newspaper advertisement for the mall, a vintage photo of an old pylon, and an aerial shot that shows the mall’s weirdest architectural feature: a tunnel. That’s right. 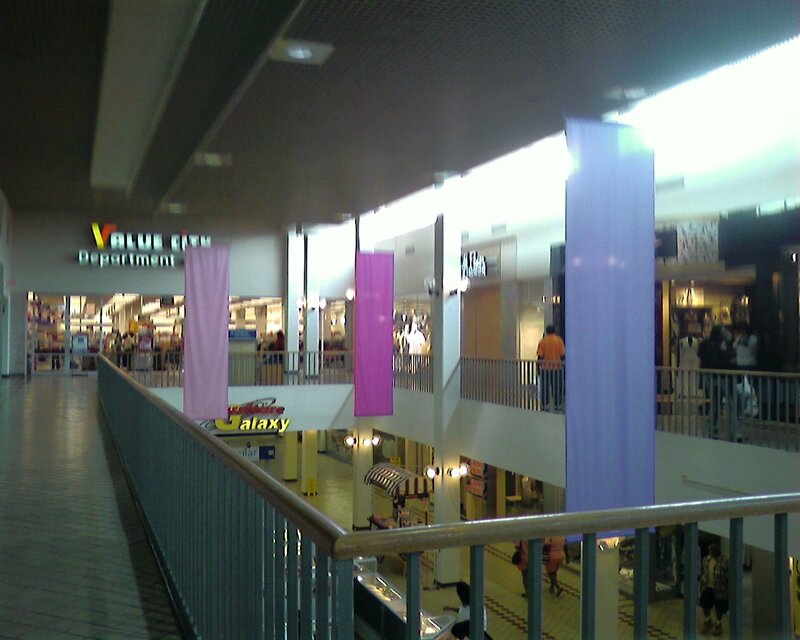 Part of the reason why the Iverson Mall was such an incredible find was that–not only was it incredibly old and not only did it still boast some great ’60s vintage decor–but the two level mall and its rear parking garage are cantilevered right over Iverson Street, a four-lane divided parkway. 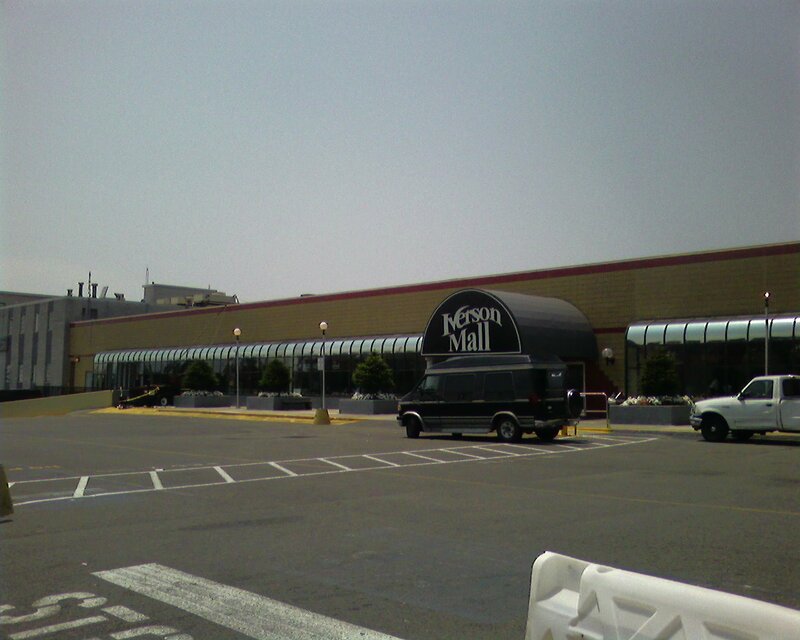 The northern wing of the mall, which is the old Woodward & Lothrop store that is today home to a Value City, is the larger end of the mall and is two levels. It stretches all the way to Iverson Street, where the second level continues straight over the roadway while the first level exits straight out to the street itself. The mall continues south of Iverson Street, with a smaller section that once lead to Montgomery Ward and is today home to a furniture store and several other tenants that are supposed to be coming soon. It again has a lower level, which exits out onto Iverson Street. 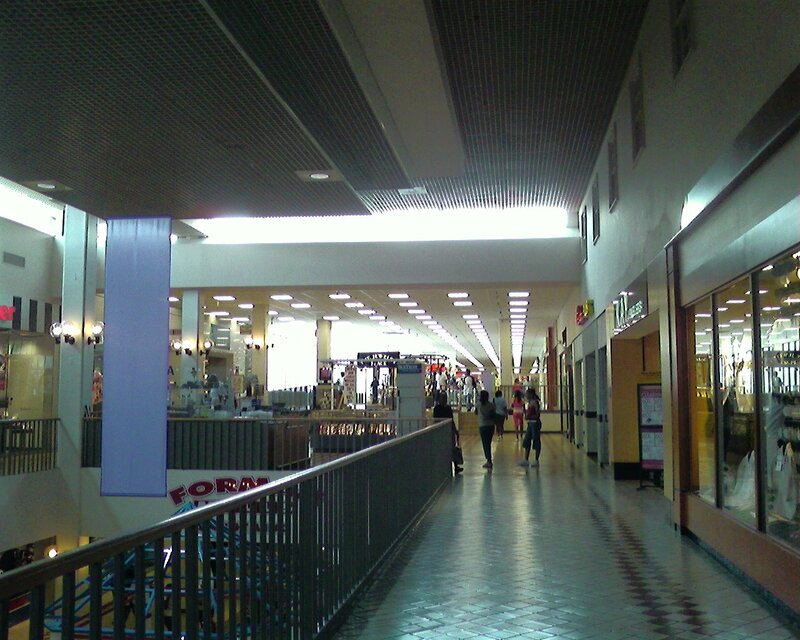 Essentially, to continue walking straight along the ground floor of the mall, it’s necessary to exit the mall, cross four lanes of traffic, and then re-enter the mall across the street. It’s only possible to stay inside of the mall by walking across on the second level. Take a look at the satellite photo (or the aerial photo above) if I’ve confused you. You won’t be sorry; it’s pretty neat! From some of the exterior architecture (which I haven’t represented well here, unfortunately), it seems that large sections of the mall were built out of existing buildings that were sort of cobbled together, especially in the spaces closest to Iverson Street. Oh, and there are some more Iverson Mall photos here; in particular there’s a shot that better represents the groovy spiral staircase in the mall’s center, which I neglected to shoot. Well…. I haven’t been to this mall in a while, but back in the mid-late 90’s I always used to visit this mall. Although I was a kid back then… I loved Iverson Mall, because of the close distance it was too my house… and all of the stores. One particular place I was always in was the Iverson Barber… this barber shop was always busy with people.. and you’d never find it empty. In some parts of the mall, it could be empty… such as the bridge that crosses over 4-lane Iverson Street… however.. people always used the bridge rather than crossing on the ground level, because Iverson Street was extremly dangerous to cross, and people have been killed trying to cross it. The southern end of the mall has the food section… when I was little, there was a pizza place, the “Great Cookie”, a place with assorted chocolates, small candies, etc., and an Arby’s. From one recent trip to the mall, the food section hasnt’t really changed. Some of you may be wondering why Im calling it a food section, well, it’s not really a food court, or at least in traditional ways. 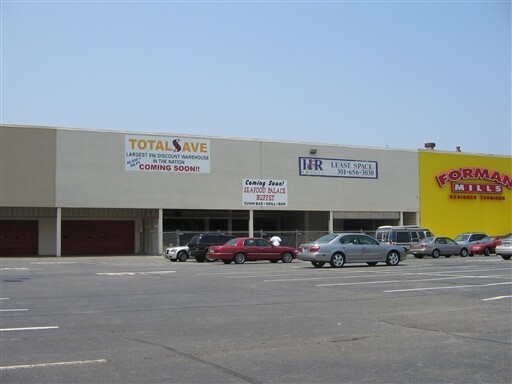 The mall is also a prime location for less known tenants, such as Forman Mills, etc. So if you shop here, you may not find stores you would normally find in malls, however, you will find what you want. Surprised you didn’t mention the even older Marlow Heights Shopping Center that’s practically next door (and on the arial view). Marlow Heights dates from something like ’55 or ’57 and is anchored by Hecht’s and Giant. The Giant used to have a huge vintage sign. What a great mall this used to be! The Woodies there was fantastic, and Iverson had the first Gap in Southern P.G. County. I was still shopping there in high school, so it lasted until at least the mid-80s. The Laurence Reed store shown in the photos is the only original store left from the mall’s 1967 opening!! I used to work by this mall and always wondered how it stayed open. It has a lot of mom and pop stores and a real “ghetto mall” feel. That said, I think the mall is able to stay in business because there are really no other large retail options in the area. There used to be a Target “Great Land” (similar to a Super Wal Mart) up the road but it went out of business. 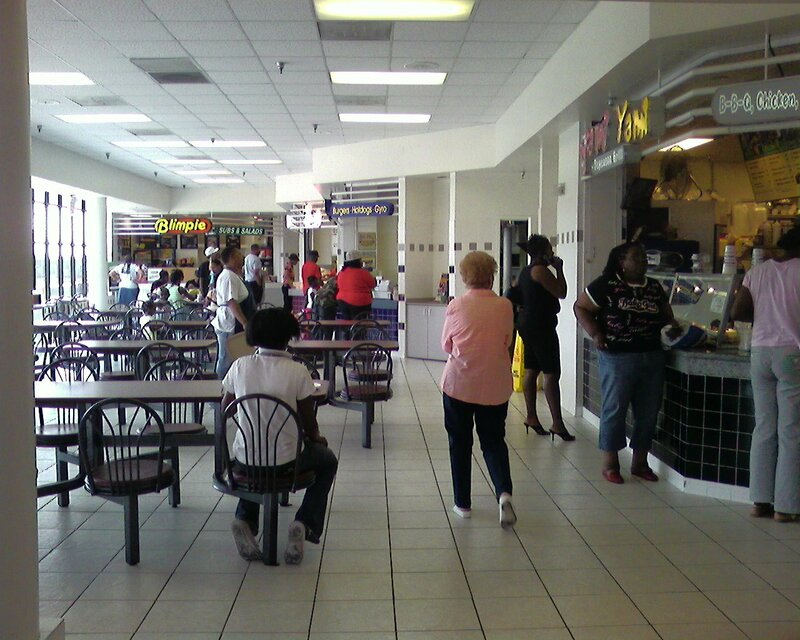 Although it doesn’t have a food court it does have a lot of fast food restaurants in the parking lot and, as blackguy mentioned, it is next ot the Marlow Heights Shopping Center – which helps draw customers there and make it a one-stop shopping area. I really don’t see this mall going any where because there aren’t any other places nearby to shop. -His name was Buckguy, not Blackguy. what was the owners name of iverson jewerlers it was frank something? Uh where was the Target Greatland? I grew up near by and never remember there ever being any Target stores in the DC area until 1996, when there were 10 or so opened on one day. Maybe you are confusing the Bradlees on Allentown Road, which is now a church, with a Target GreatLand. 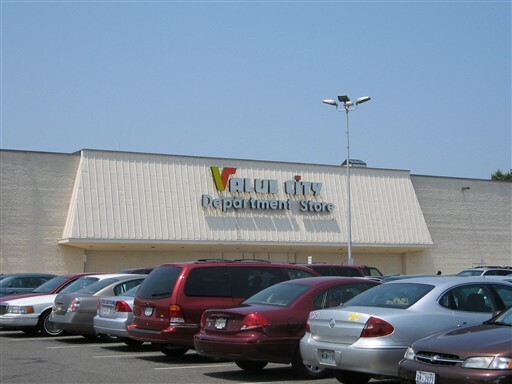 Now that Value City has pulled out of Maryland, now that space is becoming a Burlington Coat Factory. I grew up in Marlow Heights. I was there when the mall opened. It was considered to be HUGE!! I believe it was one of the first malls in the country, much less PG County. I was recently there and was happy to see a busy, clean, occupied mall. I saw mention of Marlow Heights Shopping Center. As a kid, when Hecht’s was being built, I thought the cover over the outside steps was a sliding board!! WOW!! haven’t thought about that in a good many years! Iverson Mall was magical when i was a kid, Santa was there in the winter, easter bunny in the spring and it’s the first enclosed mall i can remember back in ’77 when my Mom used to bring me there. The movie theatre next to the mall was a big deal also. Roy Roger’s chicken (don’t see many of those now) was there, buster browns shoe store where I received my new penny loafers each year for school. Oh and back then, AT&T ruled the world of communications and they had a store in the bottom level of the store (accross from stride ride shoes) imagine this: your phone breaks, or anything goes wrong, simply bring the phone back to the store, they get you another and your on your way……….ah, things were so simple then! WOW this brings back soooo many memories… I remember shopping here alot duirng the mid 80’s to the early 90s which I would call the DC metropolitan’s area golden age of shopping. Why? becuase during that time, every major area had their own host of well established shops. Iverson mall had a woodward and lothrop and montgemoery ward and blocks down was hecht’s dept store and a row of boutiques. Landover mall, boatsed a woodies, hechts sears and a garfinckels (BTW Garfinckels was extremely exclusive, on bar with saks and neiman marcus, it’s downtown flagship clothes the first ladies…) … for those in VA, there was tysons corner, seven corners, landmark, and springfield mall… chevy chase had its own shopping district and white flint carried over the rockville area. Nowadays, it’s either Pentagon city, tysons corner or montgomery mall… everywhere else is either lacking or just dead. I grew up on Pennsylvania Avenue SE in DC. In the 60s we used to take the bus downtown to one end of the shopping district and take the bus home from the other end. Garfinkels was a bit expensive for my high school budget, but I was a member of the Mary Jane Earring Club – buy 10? 12? 100? get one free! 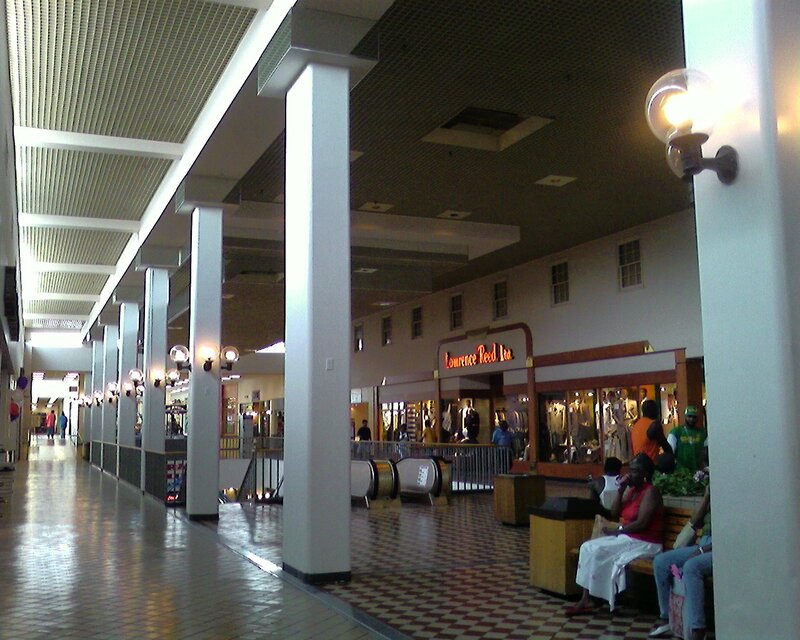 I was trying to remember the name of Iverson Mall and came across these memories. Thanks. While the DC metropolitan area of the mid 80s to early 90s might have been a period of overall positive retail, I can’t say the same for Iverson Mall of the same time. When Iverson Mall opened in 1967, it was the DC area’s first indoor, climate controlled mall (“Springtime is Forever at Iverson Mall”). Probably around the late 70s and early 80s marked the beginning of the prime retailers pulling out of the mall. Though the mall still continues to enjoy a thriving business, it does so without any real nationally recognized stores. The true golden era for Iverson Mall was the 60s and 70s. The same can be said for the Marlow Heights Shopping Center. Is there a store in Iverson Mall that airbrushes paint on tshirts?